This is for Abrasive Pinch Valve Part numbers 69020015 Pinch stomper valve complete, 43000290 Hex bolt, 43007260 Internal Starlock washer, 44000500 o-ring, 44000505 u-cup, 44000506 o-ring u-cup kit, 62030015 Cylinder, 62030020 piston, 62030025 Base, 62030055 spacer. The pinch valve stops the flow of abrasive through the blast hose by "pinching" it off. It is sometimes referred to as a stomper valve or guillotine valve because of the way it operates. 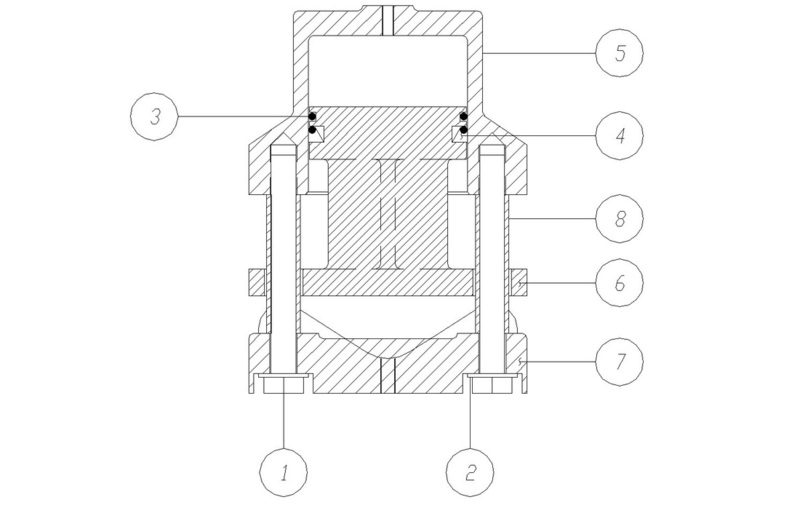 The base of the pinch valve is subjected to a lot of abuse by the piston. SAFE Systems' pinch valves have the heaviest base in the industry to survive that abuse and save downtime and repair costs. The pinch valve is air actuated and in order to operate properly, the O-ring and U-cup must seal tightly. Replacement of these seals is the most common repair needed on SAFE Systems, Inc. pinch valves.